Only the candidate and one parent/guardian should enter the counseling hall. The candidate and his parent/guardian should be seated in the hall by 9:30 a.m. as the counseling process will be started from 10:00 a.m. It is advised that candidates from outside Gangtok should reach Gangtok in advance to avoid traffic jams and road blocks. However, the State Government will not provide any TA or DA to candidates. If a candidate is absent when his/her name is announced for allotment of seat or do not opt to avail the seat in that counseling, he/she will forfeit his/her claim for the allotment of seat available at that time and person next in merit will be called for allotment. He/she may, however, be considered for allotment in subsequent counseling if seats are available for allotment. In case the original marksheets of the qualifying examination has not been received, candidates should produce print out of the marks downloaded from the internet. However, candidates must produce original marksheets at the time of issue of nomination letter. Candidates present in the counseling who was not allotted the quota seats due to exhaustion of seats or non availability of seats in that counseling can attend subsequent counseling if any. In case any of the seats is surrendered, such seat will be allotted in the next round of counseling. The candidate must bring original and one set photocopy of the relevant documents indicated below. Though other documents would have already been verified candidates are advised to carry relevant original documents which may be required for re-verification. (i) Marksheets of the relevant qualifying exams. (ii) One year nursing internship certificate for MSc. Nursing. 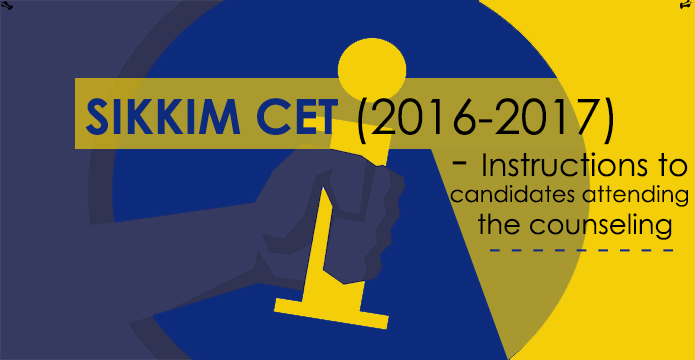 Candidates are advised to thoroughly go through the Guidelines for allotment of State quota seats-CET, 2016. Since the roll numbers of the candidates are allotted one month prior to CET, candidates are advised to practice filling up of roll number in the specimen copy of OMR sheet uploaded in the Departments website. Application of correcting fluid in OMR sheet is not allowed. Candidates are advised to be extra cautious while filling up roll number in the OMR answer sheet. Any mistake in filling up the roll number will result in cancellation of the answer sheet. If the answer sheet is cancelled due to this reason, the department shall not be held responsible. HRDD has empanelled few institutions who have offered seats for various courses which are in demand. Due care has been taken in selecting the institutes as well as the courses which the students can avail. It is, however clarified that it is purely the discretion of the candidate/guardian to avail the seat and department do not promote any college in particular. The candidates are also advised to log on to the institute’s website to ensure that they suit their requirements before availing the seat.FOR FURTHER MORE INFORMATION FOR THE SAME VISIT OUR OFFICIA SITE www.besonline.in . AP ECET 2019 Exam Postponed! Download Admit Card Here! Why Do Indians Prefer Studying Abroad?